I have found that tea tree oil soap in a superior moisturizing bar or liquid soap, is a hard-working, deep cleansing soap. Tea tree oil in soap becomes an odor fighting deodorant bar, or an ingredient in an antifungal foot wash, or part of what makes a great acne cleansing bar. It's "The All Natural Cleaning Solution Of Tea Tree Oil!" Antibacterial Bar Soap was the first commercially blended Tea Tree Oil product. It was manufactured by the Australian division of Colgate-Palmolive. The soap seemed to disappear after the war due to the discovery and marketing of synthetic disinfectants. In the early 1980's soaps, lotions and creams became more popular as companies grew marketed and promoted their particular products. In 1983 The Associated Foodstuff Laboratories in Australia conducted tests that proved that the Tea Tree Oil Soap had a lower bacterial count then that of synthetic soaps which in many cases cost more money. The Superior germicidal action that Tea Tree Oil has -- is absolutely Magical! Natural soap makers and natural soap making suppliers realize that not only manufacturers, but also consumers, want safer alternatives to the petroleum based detergent soaps found on supermarket shelves. People are looking for organic soap and tea tree oil soap more often, because tea tree soap not only kills germs and bacteria, it has a clean and refreshing scent that makes you feel cleaner. If you have dry skin or hands, you might want to find a soap that combines aloe and tea tree oil for a softer cleansing bar or liquid. Also fairly new to the market is a soap that claims it can help prevent fungal infections like ringworm, athletes foot, nail fungus, jock-itch, and more. Yeast Infections and Jock Itch. Also Deodorizes and Refreshes Smelly Feet and Body Odors. Relieves Itchy, dry flaky skin with the help of Aloe Vera and our organic blend of Coconut, Olive and Jojoba Oils. Each has its own healing properties that will moisturize and soothe your skin." 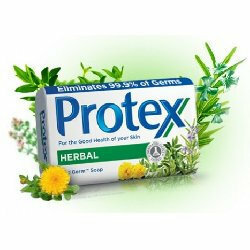 The product is supposed to be good for acne on the back, chest, and other areas of the body as well. 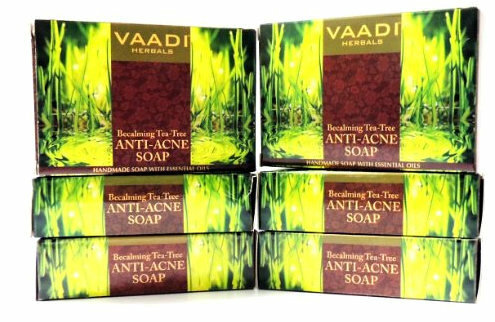 One more tea tree oil antibacterial soap product that looks like it might be really good, is the Vaadi Herbals Anti-Acne Bar Soap. It just sounds like it must smell amazing! It's made with 100% pure essential oils like Tea Tree Oil, Clove Oil, Turmeric and Citrus Extract. All of these are known to help with getting rid of germs and their soothing properties. "Clove Oil's anti-bacterial property helps in keeping off the microbial activity from the skin surface, thus helping in preventing acne and pimples. Clove oil kills the bacteria that starts to feed on the sebum generated, thereby reducing all possible chances of spreading of acne by nipping it in the bud. Also, Clove oil is a natural exfoliant that clears off the dead skin and excess oil to make way for a healthier, clearer and glowing skin. With Clove Oil, the skin breathes as the pores are unclogged and bacteria-free. Turmeric possesses every possible solution to yield a beautiful, sun-kissed skin. Cleanses the skin inside out and gives a radiant natural glow. Turmeric prevents and fights breakouts & Pimples. Good for Oily Skin Turmeric regulates the production of sebum which is produced in the sebaceous glands of the skin. This helps in deep pore cleansing leading to a fairer, flawless skin." Personally, I think this soap is worth a try for the fragrance alone!